https://firstandonlyevents.co.uk/missions/open-day-856/ Game Day Schedule Gates open 8-00am Safety brief 9.30am Games start 10.00am Lunch 12-1pm end day 16.00 or at Dusk, whichever comes first Cost · Walk on – £25 (Silver member £20/Gold member £15) including lunch · Hire – From £15 · Hire Package 1: Gun, Mag full of BB’s, Full face mask, Protective clothing – £15.00 · Hire Package 2: Gun, Mag full of BB’s, Full face mask, Protective clothing, Tactical combat vest, Extra mag, Bottle of 3000 BB’s – £25.00 All hires must book via the online booking System: Pre-Site Rules: FPS limits Measured with 0.20g bbs Under 350fps for AEGS ( no variance) Under 400fps for DMR (60 foot engagement range) Under 500fps sniper rifles (60 foot engagement range) Pyro: we only allow the use of TLSFX pyro that is bought on site or BFG's with 9mm or below. BBs/Ammo: · Plastic BBs only which do not shatter on impact are allowed on our sites. · For Hire Guns, Only bbs sold at our site are allowed in hire guns. Note :Ages 13 and upwards (13 to 16 please ring for advice regarding parental consent and adult supervision.) Facilities: Charging Facilties, Parking, Food and refreshments First and only Retail Mobile shop (Gold and Silver 5% Discount applies) Contact the shop at [email protected] or 07763125315 if you wish the shop to bring anything specific. Hi, just joined as it'll be my first time at an F&O site this weekend. Been playing for a few years now, mainly at The Mall or Ironsight. Looking forward to playing at The Base on Sunday! 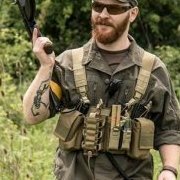 Am I too old for airsoft?